One of the best things about summer is making s’mores. Warm toasty marshmallows, melty chocolate and graham crackers – it’s amazing how a few simple ingredients can combine into one of the most beloved treats. Today is all about celebrating National S’mores Day! The great thing about celebrating s’mores is that all you really need is lots of chocolate, marshmallows and graham crackers, and the possibilities are endless! There are so many great s’mores-flavored recipes you could try and add to the party, but today we’ve got a Mini S’mores Tart recipe for you and a few other ideas for your S’mores party. So let’s start off with the Mini S’mores Tarts. They are nice and easy to make and are such a cute and fun variation on the traditional treat. 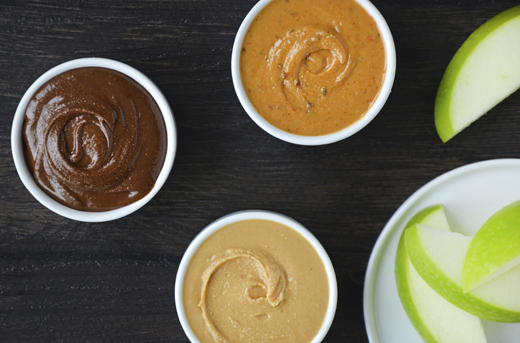 The best part is you can make them right in a Muffin Pan! 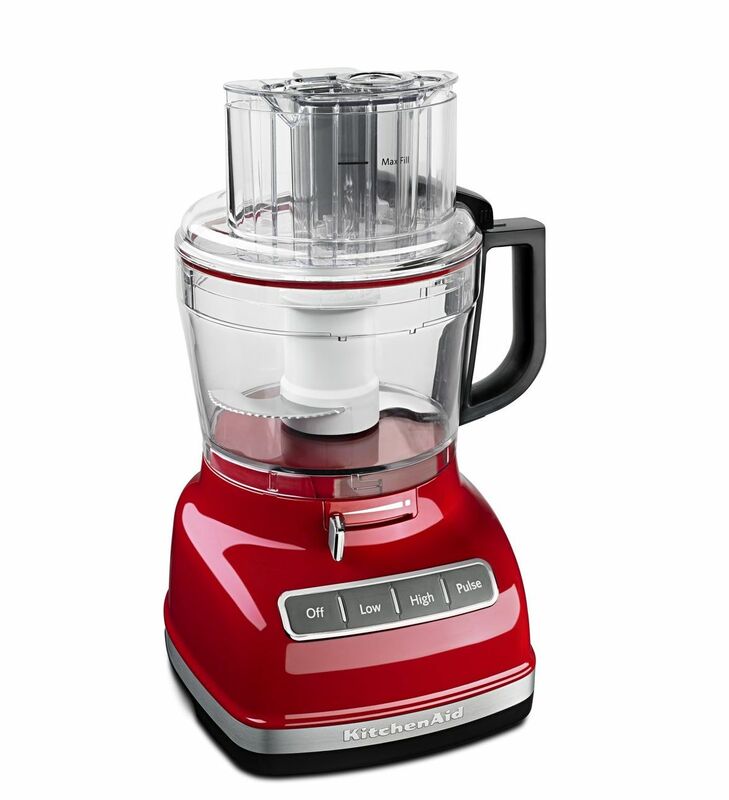 The first thing you’ll need is your KitchenAid® Food Processor. The large cup capacity makes it easy to turn the graham crackers into crumbs quickly and simply. Just add the graham crackers to the bowl of the Food Processor and pulse. 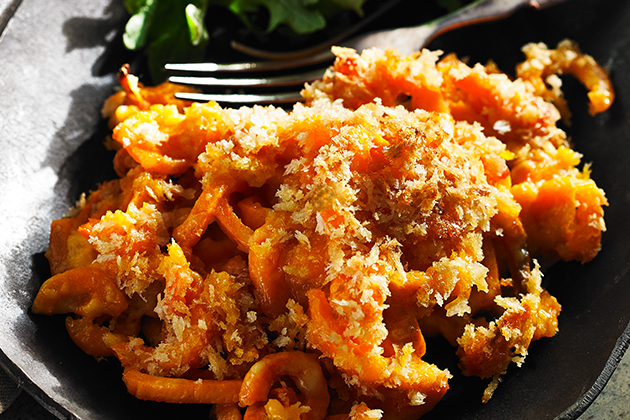 You should end up with beautiful crumbs, ready to be combined with some sugar and butter to form the crusts. Spoon about 2 tablespoons of the mixture into each cavity of the Muffin Pan from your KitchenAid® 5-Piece Bakeware Set. I used the bottom of my tablespoon to help press the crusts into each cavity. The crusts will bake for about 5 minutes on 350°F to help them hold their shape. While the crusts bake, you’ll make the chocolate ganache by pouring hot heavy whipping cream over chocolate chips in a heat-proof bowl. Allow the chocolate chips to sit for 3-5 minutes, then whisk until smooth. Add about 1 tablespoon of chocolate ganache to each semi-baked crust. I much prefer the chocolate ganache to a regular bar of chocolate because it has a much smoother consistency when you take your first bite. The ganache will stay relatively firm, yet soft enough to bite even though they aren’t fresh out of the oven. Top the chocolate ganache with some marshmallows and they’re ready for browning! To toast your marshmallows, you can use one of two methods: Baking in the oven for about 8 minutes at 350°F or using a kitchen torch. I find that a kitchen torch makes for a fun method, but if you don’t have one or prefer not to use one, the oven works just as well. Once done, let the tarts cool completely. The ganache will be quite soft when warm, so you want them at room temperature or cooler for them to be easy to handle. Once cooled, they are ready to serve. 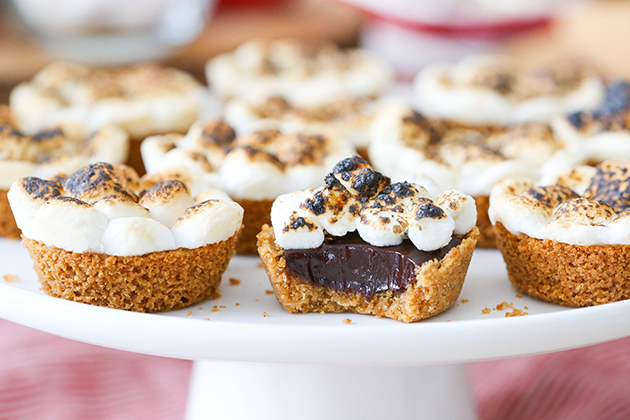 These tarts are such a perfect make-ahead treat for this s’mores party! To add to the party, I also made a quick s’mores dip with some additional chocolate ganache and toasted marshmallows. And, if you’d like to serve the traditional s’more, you should also have on hand extra graham crackers, marshmallows, and traditional chocolate bars. To add some flavor to the traditional s’more, I had chocolate chip cookies on hand to use in place of the graham cracker and a plethora of different chocolate candies – peanut butter cups, caramel-filled chocolate bars, and cream chocolate bars – to pair with a big marshmallow! For more inspiration, take a look at these other s’mores recipes I love: S’mores Berry Tart, S’mores Cupcakes, S’mores Icebox Cake, and S’mores Cheesecake. I hope that those recipes and this post all give you the inspiration you need to host your own s’mores party! What would you make for a S’mores Party? 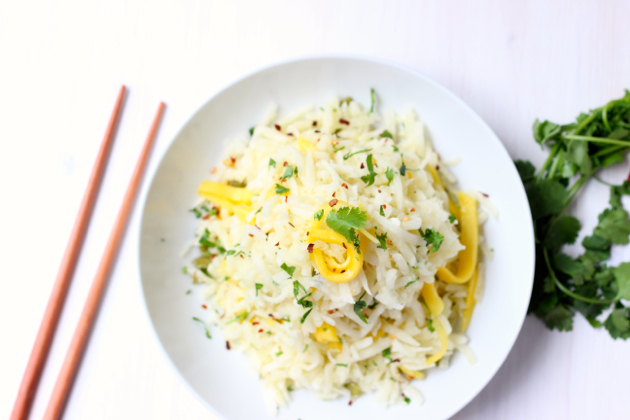 Share your take on this recipe on Instagram using #MadeWithKitchenAid for a chance to be featured. Preheat the oven to broil at 350°F. 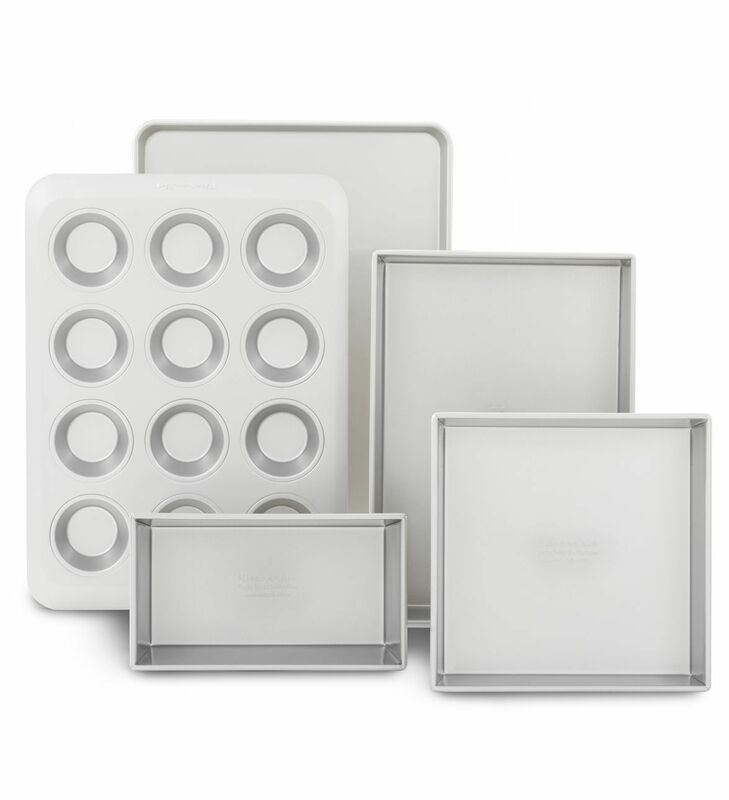 Grease the Muffin Pan from your KitchenAid® 5-Piece Bakeware Set with baking spray. Break the full sheets of graham crackers into pieces and put them into the KitchenAid® Food Processor. Process the graham crackers into crumbs. You should end up with 1 1/2 cups of graham cracker crumbs. In a medium-sized bowl, combine the graham cracker crumbs, butter and sugar. Spoon about 2 tablespoons of the mixture into each cavity of your Muffin Pan. Use the underside of the tablespoon to press the crumbs into the Muffin Pan, forming the crust. Bake the crusts for 5 minutes. While the crusts bake, add the chocolate chips to a medium-sized heat-proof bowl. Heat the heavy whipping cream in the microwave until it begins to boil, then pour it over the chocolate chips. Allow the chocolate chips to sit for 3-5 minutes, then whisk until smooth. Spoon about 1 tablespoon of ganache into each crust. Top the chocolate ganache with a small mound of mini marshmallows. To toast the marshmallows, use a kitchen torch or bake in the preheated oven for 8 minutes, until brown on top. Set the mini tarts aside to cool completely to room temperature, or set in the fridge to speed up cooling. Remove tarts from pan when completely cool and serve at room temperature.